What is a (B) Kata? Kata: Kata is the Japanese term that corresponds to “Classical Technique” in the Nihon Goshin Aikido system. Aikido training begins with repeated practice of kata until the waza are sufficiently internalized (or mastered). In kata practice, the nage and uke follow movements that have been agreed upon in advance. Uke is a 'tackling dummy' ~ just there for the ride. He does not resist the efforts of Nage at any point. Historically, there are two basic methods are known in the practice of kata: (A) kata is practiced and performed in a flowing fashion as precisely as possible, usually following the demonstrations of a master instructor; (B) kata is practiced as a prototype of some basic waza. (A) The first concept is applied in kata practice in most Aikido schools. It helps to see applications as (A) katas in that they provide a real world scenario, and ensure the mastery of the (B) kata adapted for different circumstances. Students in the art of Nihon Goshin Aikido are urged to practice kata in this manner (B) first, then (A), without implying any prejudice against other Aikido organizations. 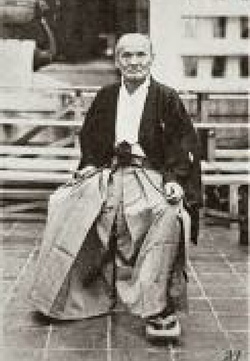 The 50 (B) kata that make up the Classical Techniques allow for consistent transfer of the knowledge base, anchor the art, and protect the unique brand of Nihon Goshin Aikido. As important as the (B) kata is to our art, I believe that focusing on (B) Kata ~ at the expense of training in (A) Kata applications ~ does a potential disservice to the NGA practitioner, and our art in general. When you read comments from traditional aikido guys who have trained with someone from our style, a consistent comment you will pick up on is that we are often perceived as “stiff” in our application of technique. In my mind, “stiffness” is the implication of the early learning process of the Classical Techniques gone wrong ~ or at least a symptom that study of the inevitable, and more martial, (A) Kata is being neglected. Here is my attempt at a video explanation of the Classical Technique, and it’s role in student development. Sensei John Carter explains the Classical Technique ~ it’s purpose ~ T-Ball Training:” ~ Using Slap to the Side of the Head as the Technique. Includes some applications also (two hand jacket grab, round house punch, jacket grab & punch.